Thank you from Westercon 66! ...for a fun convention! 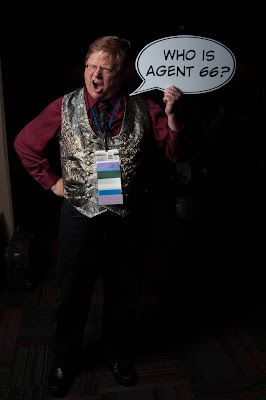 Check out our rogues gallery, people at Chicon asking "Who is Agent 66?" Heads-up, gang, the Chicon app is live in the iTunes Music Store. I've read a few of the usual review sites, but was interested in getting feedback from locals or visitors who can recommend (or suggest I avoid) places. Prefer near the con as I don't have a car, but am open to using public transportation or taxi. Three days remain until everything begins! Are you all packed? There will be a Classics of Science Fiction discussion set at Chicon. Frankenstein, R.U.R., and Pebble in the Sky. Check out http://chicon7.org/prog-classics.php for more. On Friday evening, Moebius Theater will be putting on an audio play production of The Island of Dr. Moreau. http://chicon.org/moebius.php for more. The agenda and reports for the WSFS Business Meeting are available at http://chicon.org/business-meeting.php. Three press releases today, ladies and gentlemen. Chicago, Illinois, USA - Chicon 7, the 70th World Science Fiction Convention (Worldcon), is pleased to announce that it will be providing its members with an online application for handheld devices that provides key convention information. The app was developed in partnership with Viafo (www.viafo.com) and is available for Android phones and tablets through Google Play, and will shortly be available for iPhone and iPad through the iTunes App Store. Chicago, Illinois, USA - Chicon 7, the 70th World Science Fiction Convention (Worldcon), today issued more information on the final Hugo Awards Ballot, along with additional information on the Hugo Awards Ceremony taking place on Sunday, September 2, 2012. A total of 1922 valid final ballots were received, representing a 37.7% turnout. The figure of 1922 is the second highest ballot count in history after Renovation, the 2011 Worldcon. Chicon 7 previously announced an all-time record of 1101 nominating ballots, highlighting the ever-increasing interest and support for the Hugo Awards. The 2012 Hugo Award winners will be announced on Sunday evening, September 2, at a formal ceremony in the Hyatt Regency Grand Ballroom. At Chicon 7's invitation, the host for the night will be Chicon 7's Toastmaster, Hugo and Campbell Award-winning author and blogger John Scalzi. Members can look forward to Scalzi's inimitable combination of insight, humor and sheer coolness throughout an exciting and entertaining event. The Hugo Award ceremony will start at 8 p.m. and will be broadcast live around the world via Ustream at www.ustream.tv/channel/worldcon1. In addition, the official Hugo Awards site (www.TheHugoAwards.org) will provide live text coverage via CoverItLive. The CoverItLive broadcast will be hosted by former Worldcon Co-Chairman Kevin Standlee and Campbell Award Nominee Mur Lafferty. It is a Worldcon tradition that while the Hugo trophy itself always takes the form of a silver rocket, the base on which it stands is unique to each year. The 2012 Hugo Award base has been designed by Deb Kosiba, who previously designed the trophy bases for the 2005 and 2006 awards. Ms. Kosiba will be revealing and discussing the base design at the Chicon 7 Opening Ceremony on Thursday, August 30, and members are encouraged to attend for a first look at this coveted item. The Hugo Awards are the premier award in the science fiction genre, honoring science fiction and fantasy literature and media as well as the genre's fans. The awards were first presented at the 1953 World Science Fiction Convention ("Worldcon") in Philadelphia (Philcon II), and Worldcons have continued to present the awards annually for nearly 60 years. Chicago, Illinois, USA - Chicon 7, the 70th World Science Fiction Convention (Worldcon), is sorry to announce that Artist Guest of Honor Rowena Morrill will be unable to attend the convention. Rowena has recently been hospitalized following health problems, but is now recovering well. She has expressed her regret that she is unable to make a personal appearance at Worldcon. Rowena's original art, prints and books will still be on display and for sale in the Chicon 7 Art Show and Dealer's Room, and Rowena's many fans are encouraged to stop by to appreciate her work. bovil — Thank you from Westercon 66!